Furcadia is a fantasy world of magic and creation, alive with adorable animals and mythical creatures. Choose your favorite customizable avatar and start exploring this friendly, user-empowering Online Social Game (MMOSG) with rich player-driven content. Use the free, simple yet powerful tools to build literally anything you can dream up! Whether you enjoy Socializing with friends, Exploring, Creating, or Roleplaying, we invite you to an interactive experience unlike any other. On Furcadia, you can be who you want to be! You can select from 11 different avatars and choose between three genders: male, female, and unspecified! If you want even more options, you can also choose to buy from our Digo Market. 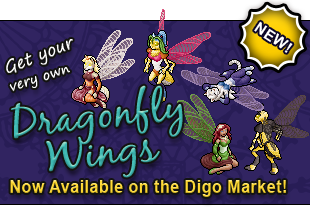 Digo Market supports Furcadia's maintenance, servers, and new features! However, Furcadia is and always will be free to play so buying from Digo Market is completely optional! You can customize your look on Furcadia by choosing a selection of colors from a palette. Your avatar can walk around in the world, with the ability to stand, sit, or lie down. When you click on someone (or yourself!) you will see a written description, as well as your avatar's default portrait! You can also choose to wear a completely custom uploaded portrait by buying a portrait space on Digo Market. Additionally, Furcadia offers total freedom in making player-made worlds, called dreams, which are completely free to upload and add patches to. You can easily add custom avatars and portraits in your own dreams, as well as visit other players' entirely custom made dreams, whenever you want! Furcadia has one of the best, long-standing communities on the internet! We have players from all over the world, from all ages, and with all sorts of interests and professions! Furcadia's userbase is 60% female as well! Furcadia has developed into a wonderful community over the years, and a very special part of that is the large volunteer program called the Beekins! They are named after the friendly mascot, Beekin the Help Dragon. These volunteers are divided into groups according to different specialties, including moderating the community, welcoming new players, offering in-game technical support, making official art, helping players build dreams, updating the website, and running events. All of these volunteers over the years have had a huge impact in making Furcadia the great community it is today! Furcadia has the Guinness World Record for the longest running social MMO on the internet since it has been online continuously since 1996! This means it has a rich history and decades worth of player-made content! Explore hundreds of unique player worlds, as well as participate in Festivals and Events that are run regularly by the staff and volunteers! Furcadia is all about user-created content! Throughout all of our main server maps are portals to other players' own worlds (called Dreams). You can easily visit anyone's dream on Furcadia! Compete in seasonal Furcadia-wide Dream contests! The world of Furcadia is made up of dreams... some of these are main maps, but the majority are dreams created by players like you! A Dream will stay open on Furcadia as long as someone is inside it! If it's empty for an extended amount of time, it will be unloaded automatically, unless your Dream's community has a Group Package. You can use thousands of default art pieces in your own Dream, ready made, and find decades worth of free player-made content available for download via third party websites. Art pieces in patch files ending with 'e', such as iteme, floore, etc. allow you to use both default art and new art without overwriting anything! Your Dream can also use audio files and music in WMA, Ogg, MOD, S3M, WAV, mp3, and MIDI formats to enhance the experience of your visitors! Furcadia's scripting language is called DragonSpeak, and it is written in plain English so it is very intuitive to use! Even better, dreams don't need to have advanced scripting to be uploaded. DragonSpeak was made so you can interact with Dreams! You can use triggers such as in-game actions, custom buttons over the game interface, and text based commands! An example of simple DragonSpeak! In essence, DragonSpeak gives you the ability to interact with Dreams, ranging from the simple, like opening a door, to the more complex, such as a full game of Capture the Flag or chess. You can also use bots to do things that are more advanced but these are not supported by Furcadia officially. You can roleplay your favorite character and be whoever you want on Furcadia! Some dreams are Ferian based (animals on four legs), others are Hyooman (similar to real life), and some are Furre (anthropomorphic animals)! There is a range of other styles, including all the common themes revolving around fantasy, steampunk, sci-fi, etc. based on popular books, TV, or even original creations! If you can think it up, you can probably find a similar Dream somewhere on Furcadia (or make your own)! Although there are a variety of dream types that are popular in Furcadia, players are always coming up with new ideas in their Dreams using Furcadia's tools. Furcadia categorizes dreams based on if they are mainly Social, Persona Play, or Strict Roleplay, and throughout your exploring, you can find dreams of all kinds! You can find active groups to roleplay in on our Groups pages as well! 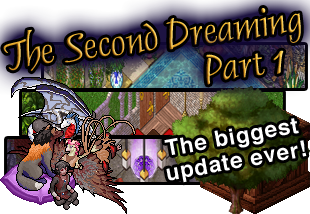 Since Furcadia has such a long legacy, we are working on The Second Dreaming project. This is a huge, community funded project which is raising money to update the game! You can read all about the goals reached so far and future plans for this project here! Furcadia is a unique and magical place created by the community. Whether you like to Roleplay, Socialize, Explore, or Create, we hope that you find yourself at home in our wonder-filled, imaginative world!